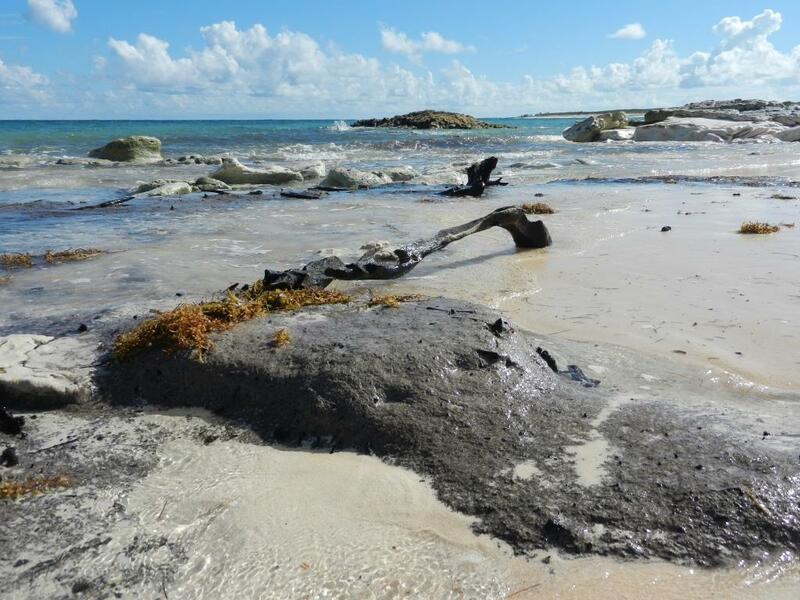 We report an intertidal, bone-rich peat deposit on the windward (Atlantic Ocean) coast of Abaco, The Bahamas. The age of the Gilpin Point peat (c. 950–900 cal. yr BP) is based on five overlapping radiocarbon dates (one each from single pieces of wood of buttonwood Conocarpus erectus and sabal palm Sabal palmetto, and single bones of the Cuban crocodile Crocodylus rhombifer, Albury’s tortoise Chelonoidis alburyorum, and green turtle Chelonia mydas). The short time interval represented by the charcoal-rich peat suggests rapid sedimentation following initial anthropogenic fires on Abaco. The site’s diverse snail assemblage is dominated by terrestrial and freshwater species. The peat is exposed today only during exceptionally low tides, suggesting a lower sea level at the time of deposition as well as a degrading shoreline during the past millennium. Fossils from Gilpin Point represent a late-Holocene vertebrate community at the time of first human presence; only 10 of the 17 identified species of amphibians, reptiles, birds, and mammals still live on Abaco. Numerous unhealed bite marks on the inside of the thick carapaces of the green turtle attest to consumption by Cuban crocodiles, which probably scavenged turtles butchered by humans. This concept, along with the dense concentration of bones in the peat, and charring on some bones of the green turtle and Abaco tortoise, suggests a cultural origin of the bone deposit at Gilpin Point, where the only Amerindian artifact recovered thus far is a shell bead.